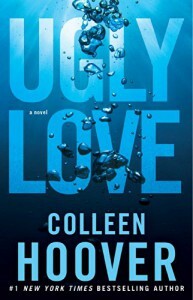 I'll admit it, this is the first book by the Goddess known as Colleen Hoover that I've read. When a very sweet author found out that I hadn’t read any of her books, she immediately shipped me off a copy. Thank you so much, Sarah O’Rourke!! Now let’s get down to the nitty-gritty of the review. I honestly wish this book was called Ugly Cry instead of Ugly Love because then you would have some inkling of what’s to come. Especially when you are in the car riders line at your daughter's school and you are reading the ending. When a stranger comes up because she sees the tears and shudders you give off to make sure that you are ok, you know you have just read an amazing book. I’m not usually one for a good ugly cry, but geesh, you just have to read it and live it while it’s happening. This author pulls you directly into the story and only kicks you out once she has finished ripping your heart out and dancing on it. Can you give a book more than 5 stars? Because if you can, I would love to get this one right up there! I have to recommend this book to anyone that hasn’t read it. You won’t be disappointed, but remember, your heart will be left mangled and your mascara on your chin.